Feel like a roast chicken but short on time? This recipe is a great solution; the wine added halfway through cooking creates a delicious sauce. Preheat oven to 220 degrees fan-forced (240 degrees conventional). 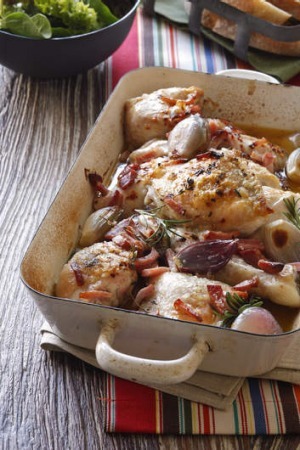 Arrange chicken pieces in a large roasting tin and scatter with bacon, shallots, thyme, rosemary and chilli flakes. Season with salt and pepper. Drizzle with olive oil and roast for 20 minutes. Add wine to tin and roast for another 20-25 minutes or until chicken is golden brown and cooked. Serve with crusty bread and a green salad.